It is not often that a small flowered Clematis makes such a big impact, Clematis x cartmanii ‘Sweet Hart’ is one that breaks the rules. This is an evergreen cultivar from New Zealand, and named after the plant breeder Jane Hart, this it is more of a scrambler than a climber and is particularly well behaved and easy to grow. 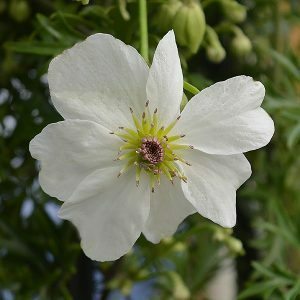 Fragrant white flowers from late winter to spring, of a plant that can be trained as a climber, or used as a mound forming ground cover plant. As a climber, we suggest a frame to around 1m to 1.5 metres in height. Although the plant is not naturally self clinging, it is easy to tie to the frame. Once it reached the top, it will cascade back down. As a ground cover , it will form a mound to around 30 – 40 cm over time. As Clematis ‘Sweetheart’ flowers on the previous years growth, and it is fairly slow growing, little pruning is required. It is an excellent selection for growing on a container in a courtyard or on an a balcony. The evergreen foliage makes this a valuable addition to smaller gardens where year round cover is required. Best planted in humus rich well drained soil, some mulch each spring, along with a general purpose liquid fertiliser will keep the plant growing well. Choose a sunny position with some protection from the heat of the afternoon sun in summer. 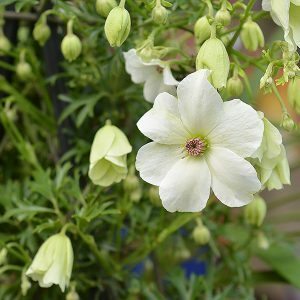 Clematis x cartmanii ‘Sweet Hart’ is frost tolerant, however it does not like wet feet, so remember to provide good drainage. After flowering, new growth with shoot out and this can become a little leggy, prune back any long shoots to maintain that nice compact habit.